Seattle Police SWAT is a full-time team that resides in District 2 within WSTOA. The team is comprised of 30 members and consists of four squads that are separated by two shifts. Seattle SWAT personnel function as “Entry” officers in addition to 10 members functioning as Snipers with four dedicated Sergeant positions and one Team Commander. All members are on call 24 hours a day, 365 days a year. Seattle SWAT handles Hostage Rescue, Counter Terrorism, Barricade situations, High Risk Warrant Services, Suspect Apprehensions, Waterborne Operations, Dignitary Protection, Emphasis Patrol, Vehicle Takedowns/Interdictions, Counter Sniper, Woodland Operations, Active Shooter, Civil Disturbance/Riots, Patrol Operations, Training Requests and state wide Mutual Aid Response. Team yearly standards require two lethal qualifications (Glock .45 / Colt Commando 5.56 / Accuracy International .308), one less lethal qualification (Arwen, Blue Nose, Pepper Ball, FN 303, Taser, NFDD and Gas / launchable and hand thrown), two physical obstacle course qualifications and one Cooper Test. In 2015, Seattle SWAT handled nearly 200 missions. That mission cadence is continuing in the current year. The Bellingham Police Department’s Special Weapons and Tactics (S.W.A.T.) team has been established to provide specialized support in handling critical field operations where intense negotiations and/or special tactical deployment methods beyond the capacity of field officers appear to be necessary. The S.W.A.T. 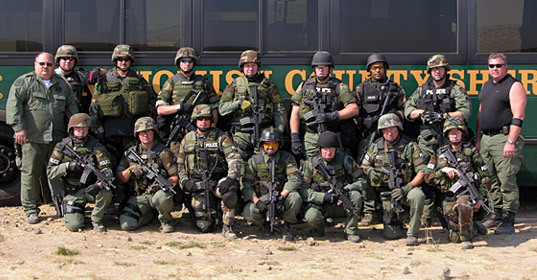 team is a designated unit of law enforcement officers that is specifically trained and equipped to work as a coordinated team to resolve critical incidents that are so hazardous, complex, or unusual that they may exceed the capabilities of first responders or investigative units including, but not limited to: hostage taking; barricaded suspects; snipers; terrorist acts and other high-risk incidents. As a matter of department policy, such a unit may also be used to serve high-risk warrants, both search and arrest, where public and officer safety issues warrant the use of the unit. The S.W.A.T. team is a part-time, voluntary assignment within the department and operators must maintain firearms proficiency and be able to complete a physical agility test twice a year in order to remain on the team. Currently the team trains once per month and has four “full-team callout” scenarios throughout the year in order to assess the team’s ability to handle various tactical problems. As standard armament the S.W.A.T. team employs 5.56 carbines and Glock handguns, with the sniper teams recently switching to the DPMS .308 weapons system. 40mm delivery platforms are being brought online to replace the 37mm delivery platform system. A Lenco BearCat and a new tactical operations command vehicle are specialized vehicles assigned to the S.W.A.T. team and have their own personnel assigned to the maintenance and operation of those vehicles. The S.W.A.T. team has been active in the Bellingham Police Department since the late 1970s / early 1980s and remains committed to providing quality and professional service to the department and community. The Chelan County Regional SWAT team is a multi-agency tactical response team covering many cities in Chelan County and surrounding areas such as Wenatchee, East Wenatchee, Cashmere, Leavenworth, Chelan, as well as responding to outside agencies through mutual aid requests. The team operators have collateral duties within their respective departments and are activated as needed. The team consists of 9 Deputies (1 commander and 8 operators) from the Chelan County Sheriff’s Office, 6 Officers from the Wenatchee Police Department and 2 TacMeds (who have a Special Commission to carry firearms). Every team member is an operator, but many have specialty training: i.e., sniper/observer, chemical agent operations, less lethal, breaching, hostage negotiations and shield specialist. Many of the operators are also certified instructors in firearms, high angle rescue techniques, defensive tactics, less lethal weapons and K-9. The Chelan County Regional SWAT Team’s primary weapons are the M4 assault rifle and Glock pistol (.40 or .45 caliber). Snipers carry Remington 700 .308 rifles. The team utilizes two personnel carriers with ballistic protection (LAV-150 [Renny] and an armored transport vehicle [Farrah]), a SUV, and a CCSO OH-58 helicopter for air support. Some specialized equipment that the team uses in deployments are: 37mm & 40mm launch platforms (for gas delivery), pole camera, night vision, shields, and helmet cameras. Team members undergo a strict testing process which includes; physical fitness test, firearms proficiency, firearms mock scenario, comprehensive arrest scenario and oral board. Once a member of the team, operators must pass a physical standards test (2 times yearly) and firearms (4 times yearly for pistol and M4 rifle and 6 times for snipers). The team’s mission is to save lives and to support area law enforcement agencies with a tactical response to critical incidents and high risk operations. The team trains monthly to handle these situations, which include high risk search warrants, active shooter response, hostage situations, barricaded subjects, positive pressure vehicle take downs, train assaults, hydroelectric dam intervention, bus assaults, tactical man tracking and marijuana eradication. The Department of Energy (DOE) recognized that a successful attack on any nuclear facility could have devastating consequences for national security. As a result, an “elite force” patterned after the U.S. military’s Special Forces was developed to protect sites that house Special Nuclear Material (SNM). The TRF is comprised of two full-time elements, these being the Tactical Response Team (TRT) and Special Response Team (SRT). Although trained in barricaded subject, vehicle assault, hostage rescue and other tactical techniques, the primary mission of the TRF is to deny adversary access to SNM. If necessary, the TRF is also trained and equipped to recover SNM that is under unauthorized control. The TRF is an “all environment” force capable of operating effectively under any lighting and weather conditions. Most of the weapons employed by the TRF are similar to those found on traditional SWAT teams. These include: CQB equipped M4 rifles, semi-auto handguns, shotguns (Tactical Breaching); and accurized bolt guns (precision rifle operations). Team entry equipment is fairly standard and includes ballistic shields, diversionary devices and various breaching tools. In addition, the SNM protection mission requires the employment of special “heavy” weapons typical to military applications. A dedicated training team allows TRF members to attend 300+ hours of training annually. Training is conducted at the Patrol Training Academy (PTA). The PTA houses numerous classroom facilities, an Emergency Vehicle Operations Course (EVOC), a gymnasium, and a running track. The ten live fire ranges located at the PTA include a 360 degree live-fire-shoot house, a known-distance range and several others designed for special weapons. TRF members must qualify semi-annually on all assigned weapons systems (approximately 17 courses) above the 90 percentile. To stay abreast of current trends, all instructors for Hanford Patrol attend the National Training Center Special Response Team and Firearms Instructor Courses. In addition, TRF Instructors have also graduated from at least one of the following, Washington State Tactical Officers Association SWAT course, LAPD SWAT Instructor Training, Special Operations Training Group (SOTG) Close Quarters Battle (CQB) Instructor, Special Forces Advanced Reconnaissance, Target Analysis and Exploitation Techniques Course (SFARTAETC) and many other related courses. The TRF also maintains a reciprocal training relationship with elements of the DOD Special Operations Community. 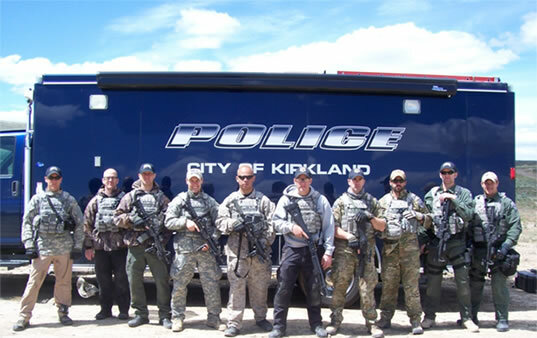 Initially formed in 1981 with five (5) members, the Kirkland Police Department’s Special Response Team (SRT) is currently authorized for 11 Tactical Operators which includes 2 Precision Marksmen. SRT trains for and responds to a wide variety of hazardous, stressful and complex tactical situations including but not limited to armed barricaded subjects, dangerous felony apprehension, high risk search warrants, warrants in support of investigations by Kirkland Detectives, the Eastside Narcotics Task Force and mutual aid requests from outside agencies stemming from events such as WTO and dignitary protection for Presidents and visiting dignitaries. SRT members have collateral duties within all areas of the department and are activated on an “as needed” basis. SRT members train in excess of 13 hours a month as well as attending a 50 hour yearly in-service block. SRT members also regularly attend training with tactical units from surrounding agencies. SRT Operators carry Sig Sauer P220 .45 caliber handguns, Colt M4LE semi-auto and/or Colt M4 Commando full-auto .223 rifles equipped with D-BAL (Dual Beam Aiming Laser) IR Pointer/Illuminators to be used in conjunction with helmet mounted PVS14 night vision monocular(s). The SRT Precision Marksmen are currently issued either a Beretta SAKO TRG-22 .308 caliber bolt action rifle or a LaRue Tactical LT-762 .308 caliber semi-auto rifle along with H&K 9mm MP5’s. Membership on the team requires an application process that consists of a firearms proficiency exam, physical fitness test, multi-faceted scenario based exam and an oral board. To apply, personnel must have 2 years of police experience and be off of probation with the Kirkland Police Department. Once appointed to the team, members serve a probationary period of 1 year, which includes completion of BASIC SWAT training. Team members must pass a physical fitness test twice a year and a firearms proficiency exam quarterly. 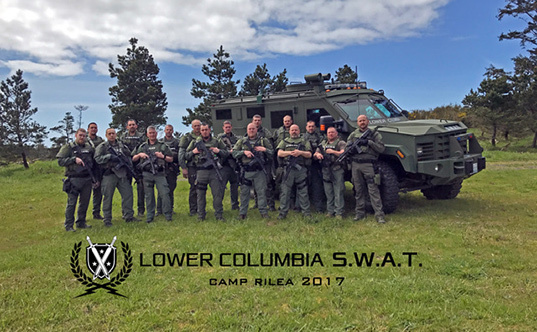 Lower Columbia SWAT is a regional tactical team that was developed in 2004 when Longview Police expanded its original tactical team to include personnel from Kelso Police and Cowlitz County Sheriff’s Office. The 17 member team currently consists of ten officers from Longview Police Department, five deputies from Cowlitz County Sheriff’s Office and two officers from Kelso Police Department. In addition to the 17 tactical operators are two TEMS officers and three logistical support officers whose purpose is to prepare equipment and operate heavy armor to free up tactical operators who can be better utilized elsewhere. The team is also assisted by five crisis negotiators who regularly train with the tactical team. The command structure for the team includes one commander from each respective agency whose assignment rotates every two years, one tactical team leader and two assistant team leaders. 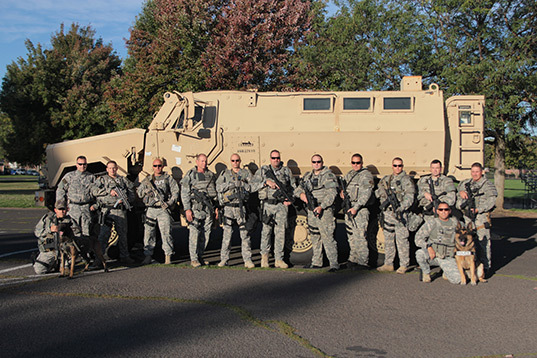 Lower Columbia SWAT is a part-time team with team members holding regular duty assignments in patrol or investigations. Interested officers must pass a multi-phase selection process to be selected for this specialty assignment. After being selected, team members must pass a yearly physical agility test and bi-annual firearms qualifications to remain assigned to the team. All team members are trained for entry, four operators are cross-trained as snipers and five are licensed explosive breachers. New team members receive Basic SWAT training through WSCJTC and receive additional training throughout the year. The entire team trains once per month and one full week per year. Sniper and explosive breaching elements have additional training days throughout the year. Lower Columbia SWAT supports all law enforcement agencies within Cowlitz County. Due to limited tactical assets in nearby jurisdictions, Lower Columbia SWAT has responded to and assisted with incidents in Wahkiakum County, Pacific County and Columbia County, Oregon. METRO SWAT is a multi-agency tactical response team, covering many of the incorporated cities within greater Pierce County. METRO SWAT provides primary coverage to the membership of the Pierce County Cooperative Cities group: Bonney Lake, Buckley, DuPont, Fife, Lakewood, Milton, Orting, Puyallup, Roy, Steilacoom and Sumner; METRO SWAT also responds to outside jurisdictions through mutual aid requests. The authorized staffing of 21 tactical officers, five snipers and five negotiators is drawn from the agencies that comprise METRO SWAT. Tactical EMS coverage is currently provided by members of the Steilacoom Fire Department. METRO SWAT tactical officers carry a variety of department issued handguns, and primary weapons are all AR/M4-type carbines. Snipers deploy with precision .308 caliber rifles in support of their mission. METRO SWAT’s support vehicles are pre-positioned throughout its coverage area; these vehicles include a fully-equipped mobile command post, a negotiator vehicle, a specially equipped SUV and personnel carriers with ballistic protection. METRO SWAT trains twice monthly on core individual and collective tasks; snipers are authorized an additional training day for their specialized job skills. The team also has a three-day training session in the fall, a week-long session in the spring/summer and an annual, full-scale evaluated exercise. Snohomish County is a part time team trained to handle a variety of situations. We pride ourselves on our professionalism and ability to remain flexible. The Team subscribes to the philosophy that SWAT carries with it an acknowledgement that we will risk our lives in a well planned and calculated manner on behalf of those innocent persons that cannot act to save or protect themselves. MD500 helicopter equipped with night sun, IR cap for night sun, FLIR and video down link camera, allowing the command post to have a birds eye view of the crisis site and surrounding area. Two of our tactical operators are K-9 handlers, so K-9 support is never far away. 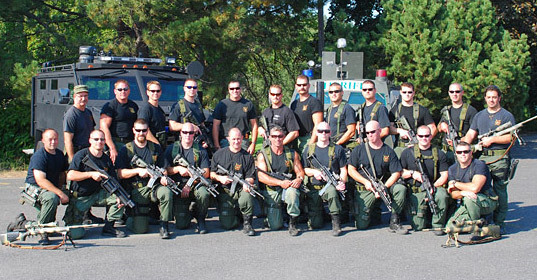 The Southwest Washington Regional SWAT team was formed in 1998 when the tactical teams of the Vancouver Police Department and the Clark County Sheriffs Office combined. Assignments within the new team were based upon experience and ability, without regard for agency of employment. A regional agreement was drafted to include participation of the remaining municipal law enforcement agencies within Clark County, Washington. 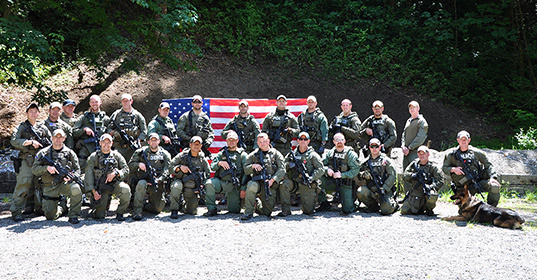 The current 24 member team consists of members from the Clark County Sheriff’s Office, Vancouver Police Department, and The Battle Ground Police Department. Candidates must to pass physical, shooting, practical, oral and background evaluations to be appointed to the team. Once on the team, members must pass a physical test twice a year and qualify with 90% shooting accuracy four times a year. The mission of the Southwest Washington Regional SWAT Team is to support area law enforcement agencies with a tactical response to critical incidents and high risk operations. These types of incidents include hostage situations, barricaded suspects, high-risk apprehension, sniper situations, high-risk warrant service, or any other situation that requires the use of specialized equipment and team tactics. 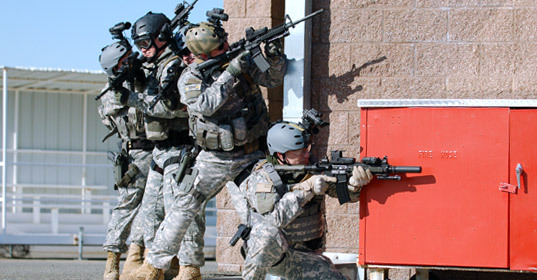 The SWAT team trains approximately 250 to 300 hours annually. Training consists of firearms qualifications, room clearing and search techniques, team movement, unarmed defensive tactics, use of chemical and less lethal munitions, land navigation, ship boarding and clearing, hostage rescue, explosive and mechanical breaching, rappel, rapid deployment and quick reaction drills. In order to be prepared for virtually any type of incident that may arise the team trains in all types of environments ranging from residential and commercial structures to vehicles such as cars, buses, and waterborne vessels. 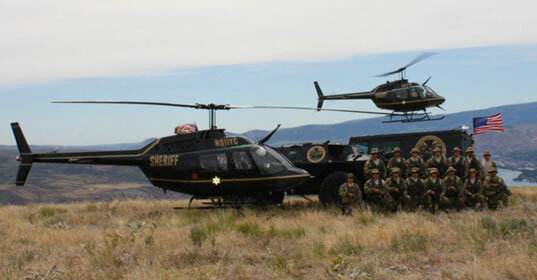 The Southwest Regional SWAT Team serves a population of about 425,000 citizens and 7 law enforcement agencies. 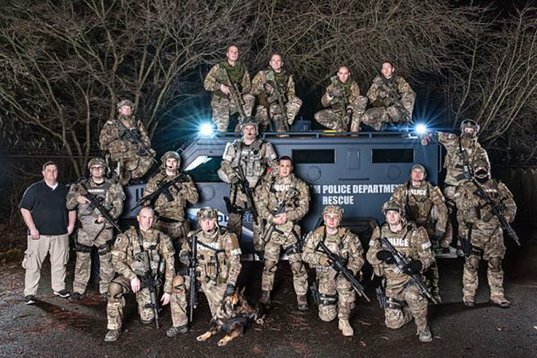 They also support SWAT teams in Cowlitz County, Skamania County and is the backup team for East Metro SWAT in the Portland, Or. Metropolitan area. The team responded to 52 high risk missions in 2007. They are regularly used to train both local law enforcement agencies and agencies throughout the state in advanced tactics such as rapid deployment, crisis management and tactical response. The unit is well respected and recognized as excellent resource to provide advanced training to patrol officers. There are two Commanders assigned to the SWAT team, one from the Vancouver Police Department, and one from the Clark County Sheriffs Office. They share command duties of the team. There is one sergeant assigned as full-time team leader from the Vancouver Police Department, which is the host agency. The assistant team leader is assigned from the Clark County Sheriffs Office. Additionally there is one sergeant assigned as the sniper team leader. There are two squad leaders for the blue and grey squads, which all members are divided between. Members fill a variety of assignments including entry team, police sniper, perimeter and breaching teams and chemical agent specialists. Five specially trained police officers are assigned as Tactical Emergency Medical Support “medics” provide medical support during high-risk missions. In addition, there at two SWAT K-9 teams assigned to the team and are specially trained to operate in high risk environments such as chemical, close-quarter battle, slow and deliberate entry and high risk apprehensions. Two Metropolitan Explosive Disposal Unit team members, one from Vancouver Police and the other from Clark County S.O. are also assigned to the team and used for explosive breaching, robot operation, lighting and other support functions. 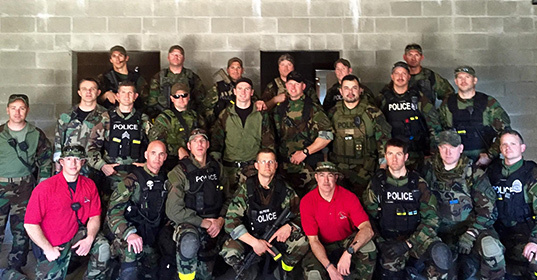 A ten-member Hostage Negotiation Team supports SWAT on all high risk missions. This team has one team leader, one assistant team leader and eight negotiators. They respond on all SWAT missions and provide intelligence gathering, documentation and negotiation services. SWAT has four armored vehicles including a Lenco “Bearcat,” two GMC “Peacekeepers” and a military surplus V150 Armored Personnel Carrier to provide protection for the team during high risk incidents. Additionally they have a large box van for transporting gear, a step-van outfitted to support the Hostage Negotiation Team, a trailer with emergency lighting, generators and a robot. The Tactical Medical Unit has a fully functional ambulance to support their services. Many of the SWAT officers have take-home police vehicles to expedite their response to situations through the service area. The team also uses the Metropolitan Air Support Team for aerial reconnaissance, command and control and other mission needs. They are outfitted with FLIR and microwave video downlink for remote viewing of missions. SWAT is a collateral duty team which means each member except the team leader has a primary duty within their respective agencies, such as patrol, detectives, traffic, etc. When the need for SWAT to respond to a situation arises, each team member transitions from their primary duty to their SWAT role. Team members are on-call 24 hours a day, seven days a week. Members of this unit are extremely dedicated and are continually striving to provide the highest level of service for the residence of our community. The Spokane County SWAT team consists of 26 tactical operators. Our tactical team trains 24 days and a week long team builder each year. Our team currently has two team medics. We also train with our local EDU unit for explosive breaching. Each tactical team member is equipped with a Commando rifle and a Glock 21 .45 pistols. We have 6 trained snipers who carry 308 rifles, one with night vision. Some of our equipment includes two Peace Keepers, a cart van, a hummer, three large box vans, a fifth wheel command post, a trailer with emergency lighting and a shared Lenco bearcat. The team also uses the department helicopter for air support.Our gas delivery systems include 37mm and 40mm launch platforms. Pole-cams, digital radios and various shields. Currently the team consists of a Commander, an admin/logistics sergeant, a team supervisor, two entry team leaders, and a sniper team leader. Each team leader is in charge of the Alpha or Bravo team, which all members are divided between. Members fill a variety of assignments including entry team, police sniper, perimeter and breaching teams and chemical agent specialists. In addition, there is a SWAT K-9 team assigned to the team and are specially trained to operate in high risk environments. In February 1983, Tacoma Police Patrol Officers attempted to apprehend a barricaded, armed subject with documented mental health issues. Officers forced their way into the home in the hope of capturing the subject by surprise. During the attempt, Patrol Officer Michael Justice was shot by the shotgun-wielding subject. Officer Justice survived the assault, but it was the third incident in less than fifteen years wherein a Tacoma Police officer was shot or killed while trying to apprehend a violent subject. The incident punctuated the need for the department to develop a team of specially trained officers who could be called upon whenever the capabilities of primary call responders or investigators, was exceeded. In 1984, the Tacoma Police Departments’ first tactical team was developed, originally called the “Special Operations Team,” which consisted of a commander, an assistant commander, eight entry operators, four marksmen, and four negotiators. It was not until a few years later that the team was called the Special Weapon and Tactics Team. Members of the newly formed team trained extensively for one year before becoming fully operational. About one year later, the team had a full-time, five-operator unit called the “Special Operations Section” (SOS). This unit evolved into the “Upper Tacoma Task Force”, then to the “Crack House Abatement Team” (CHAT) as it grew in size to about eight operators, a non-SWAT narcotics detective, and a deputy prosecutor. CHAT became part of Special Investigations and eventually dissolved of its exclusive SWAT personnel status. The SWAT Team grew in personnel, equipment and vehicles as it prepared for the 1990 Goodwill Games. Over the years it has expanded to its current elements and size of thirty-two members. Team members became well-versed in the use specialty equipment and the employment of non-traditional tactics designed to peacefully resolve conflicts. The team was very successful, but along with that success came more demands for service. 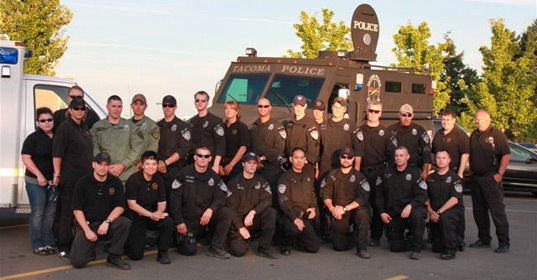 The Tacoma Police SWAT team was used heavily for warrant services, street gang suppression, dignitary protection, site security, and the apprehension of violent, heavily armed and/or barricaded subjects. The operators in the teams’ Entry, Marksman/Observer, Crisis Negotiator and Command Post elements are highly-motivated and extremely dedicated to the profession. 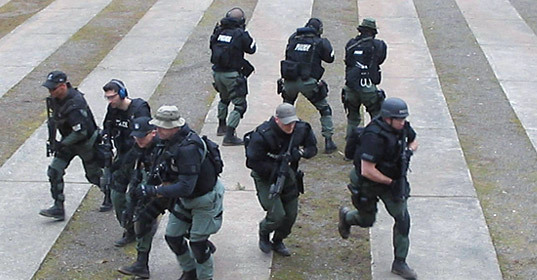 Many of the Tacoma SWAT Teams’ operators are certified instructors in firearms, high-angle rescue techniques, defensive tactics, explosive breaching techniques, less-lethal tactics and hostage negotiations, whose expertise has been sought after by tactical teams nationwide. If one were ever to see the team’s logo, they would notice the initials “WFL” followed by the numbers “061”. These markings represent the late operator Officer William Francis Lowry and his badge number. “Billy” was a well-respected team member and WSTOA instructor. He was mortally wounded while engaging an armed and barricaded hostage-taker in August 1997. In the twenty-six years of the team’s existence, he is the only member of the team lost during a tactical operation. Gone, but never forgotten, all Tacoma SWAT Team members proudly wear the markings “WFL061” on their uniforms as a reminder of Billy’s contribution to our team, the tactical community, and his ultimate sacrifice. The Thurston County SWAT team is a multi-agency tactical response team that has served the citizens of Thurston County for more than 25 years and assisted with the safe and successful resolution of critical incidents to include dealing with armed and dangerous subjects, hostage incidents, large public disturbances, barricaded suspects and the execution of high-risk warrants. 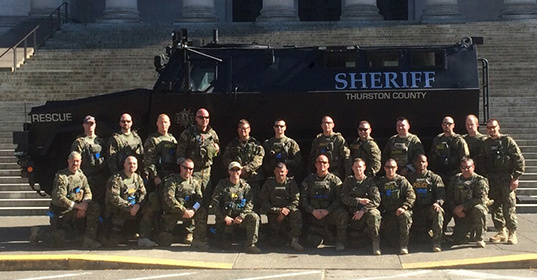 The current Thurston County SWAT team is comprised of 25 team members from the Thurston County Sheriff’s Office, Olympia Police Department, Tumwater Police Department, Lacey Police Department, Yelm Police Department, and one TEMS operator from the Olympia Fire Department. All tactical operators are trained to conduct entry and perimeter work, but four team members are designated marksmen who complete additional specialized training. Thurston County SWAT operators receive 112 hours of training annually and work closely with HNT several times throughout the year during large-scale scenario training. The SWAT team is a part-time specialty assignment with most operators working full time in patrol or detective units, but all operators must maintain and demonstrate high firearms proficiency and pass a yearly physical fitness test to remain on the SWAT team. The mission of the Walla Walla Emergency Services Unit is to support the extraordinary enforcement needs of the participating Departments. 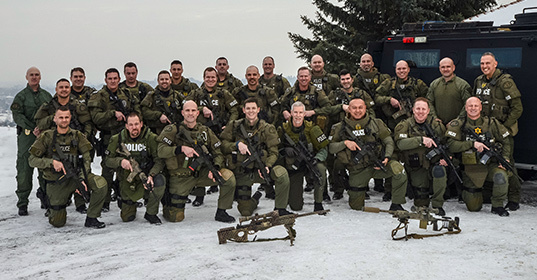 Walla Walla Regional SWAT team is a multi-agency team which serves the county of Walla Walla to include the city of Walla Walla, Columbia County, and exists as the initial response team through mutual aid for Milton-Freewater, Oregon and portions of Umatilla County. Currently, the participating agencies are the Walla Walla Police Department (Team Commander, Tactical Commander, Team Leader and 10 operators), Walla Walla County Sheriff’s Office (3 operators with one SWAT level K9), and the Walla Walla Fire Department (1 TEMS). Each operator must pass a semiannual physical fitness test to remain on the team. A six member negotiating team is attached to SWAT. As it is with many smaller agency teams, each SWAT member is an entry operator with many having additional specialty qualifications to include: sniper/observer team, SWAT K9, breaching, less lethal, firearms instructor, defensive tactics, etc. The team has limited night vision capabilities to include night vision scopes for the snipers and hand held infrared. Fiber optic and pole cams are also available. Transportation for the team consists of an unhardened converted ambulance, a V150 shared with WWSO Search and Rescue, and a recently acquired MRAP CAMAN. The team trains twice per month in addition to a block training period held once per year. Weapons platforms used by the team are the M4 in both 16” and Commando lengths, H&K UMP 40, Glock 22, MP5 and Mossberg 590 shotgun. A 40mm launcher is used for less lethal and gas introduction. It is the goal of every team member to meet these needs in a professional, competent efficient manner. The Yakima Police Department SWAT team consists of 23 tactical operators and 8 crisis negotiators. Our tactical team trains 16 days a year with an average training day lasting 10 hours. Our team has two TEMS including an anesthesiologist and a paramedic. Each tactical team member is equipped with a Bushmaster M-4 rifle and we carry Kimber Warrior 1911 pistols. We have 4 trained snipers who carry Accuracy Internationals rifles. Some of the specialized equipment in our inventory includes a Light Armored Vehicle (LAV – 150), gas delivery systems including 37mm launch platforms, lantern, spear and tomahawk, eye-pole, digital radios and various shields. We are anticipating the arrival of a new 37 foot response vehicle in April 2007, which was partially funded through a Homeland Security Grant. Our team trains annually on a variety of specialized topics including active shooter response, hostage / barricaded subject, vehicle assaults, riot / crowd movement training, warrant service, specialized firearms training, chemical agents exposure and deployment as well as less lethal training. The team has close mutual aid responsibilities with the Benton County Regional SWAT and Washington State Patrol SWAT teams. Our team is also responsible for the tactical training for the entire 127 officer department.